Police carried out 66% more stops and searches under Section 44 of the Terrorism Act in 2008/2009 than the year before, government figures show today. 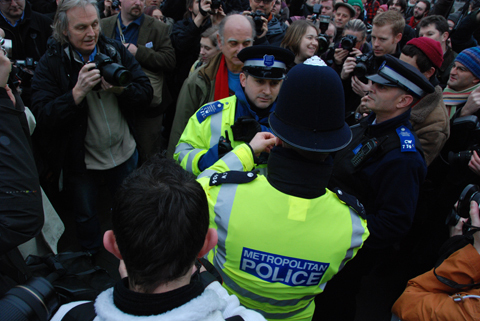 Amateur Photographer (AP) magazine can reveal that police made 210,013 stops and searches under the controversial anti-terrorism legislation in 2008/2009. However, only 0.6% of searches led to an arrest and only nine arrests were in connection with terrorism. Of all the searches, 94% took place in London – a rise of 83%. The figures are contained in the Police, Powers and Procedures England and Wales 2008/09 statistical bulletin released by the Home Office this morning. However, statistics released earlier this year indicated a 12% fall in counter-terrorism stops and searches in the 12 months to September 2009. Many amateur and professional photographers have complained about the unfair use of Section 44, which gives a police officer the power to stop someone without reasonable suspicion that they are involved in terrorist activity. The controversy came to a head on 23 January when around 2,000 photographers staged a protest in Trafalgar Square. In a meeting with Amateur Photographer magazine in March, the government once again attempted to reassure photographers that they are not being ‘targeted’ by police officers under anti-terrorism stop and search powers. Last month the government’s terrorism watchdog Lord Carlile confirmed to Amateur Photographer that he has called for Section 44 of the Terrorism Act to be abolished. Lord Carlile of Berriew QC said Section 44 is having a ‘disproportionately bad effect on community relations’. ‘Nothing fills my in-tray and in-box more than complaints on the use of Section 44,’ he told the Policy Exchange think-tank. In January, the European Court of Human Rights ruled that Section 44 is illegal. The Home Office is appealing against the decision. Last year the Metropolitan Police rejected Amateur Photographer magazine’s request for information about the number of people it stops under anti-terrorism laws after being seen taking photographs. The magazine had sought figures on the number of people stopped under Section 44 of the Terrorism Act, specifically relating to photography. The request, made under the Freedom of Information (FOI) Act, followed widespread concern that officers routinely abuse powers handed to them under the legislation. However, it seems such information is not recorded on the Met’s database. In a letter to AP, the Metropolitan Police Service (MPS) said. ‘This is to inform you that it will not be possible to respond to your request within the cost threshold. ‘This would require the MPS to search every search/arrest record to identify cases containing the information you require. The force told the magazine that it is not obliged to comply with FOI requests if it estimates that the cost would ‘exceed the appropriate limit’.